National Skill Development Corporation, New Delhi, participated in Euro Skills held in Budapest from 26.09.2018 to 28.09.2018. The natural choice was for Mr. Dahim Yaseen Bhat, who was a winner in IndiaSkills West 2018: Regional Competition on Architectural Stone Masonry held in Jaipur. It was felt necessary that two candidates, who appeared in Regional Competition on Architectural Stone masonry held in Jaipur along with other 4 candidates may undergone a Boot Camp Training at Jaipur, which was organised by Stone Technology Centre (Training Division), Jaipur, under the supervision and guidance of Mr. K. Vikram Rastogi, Chairman, Institute Managing Committee (IMC) of Government Industrial Training Institute (GITI), Amer, Rajawas, Jaipur at GITI Campus from 13th to 22nd September, 2018. Mr. Dahim Yaseen Bhat participated in Euro Skills in Budapest representing India. Mr. K. Vikram Rastogi was an expert in Architectural Stone Masonry Skills. 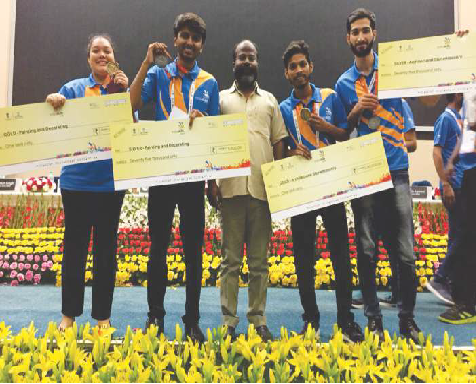 A National Competion for candidates – one winner and one runner from Jaipur Camp was organized in Aero City, New Delhi from 5th to 8th October, 2018. Three projects were given to the participants – making of templates; carving name on stone with given dimensions and a stone artifact in size of 40.5 x 30.5 x 20.5 cm in Bhainslana black marble. Mr. Kuldeep was adjudged as winner in this competition and a prize of Rs.1,00,000/- was given to him. Mr. Dahim stood second and was given a cash award of Rs.75,000/-. Mr. K. Vikram Rastogi was a Jury in this competition as well, but could not proceed to Aero City. All the activities related to Architectural Stone Masonry Skill Competition were attended by Mr. K. Vikram Rastogi since March, 2018. It is a special skill where students have to be proficient in understanding the drawings, efficiently using the hand tools and air tools and, making templates and artifact. They should have full knowledge of hygiene and safety and should possess very good communication skills. Stone Technology Centre (Training Division) proposes to start a course on Architectural Stone Masonry Skill at GITI, Amer under Institute Managing Committee in Jaipur so that students under the age of 21 years may be provided this skill training in a four month fully residential training course, thus, making them proficient in competitions like EuroSkills, WorldSkills and other skill competitions in the world.